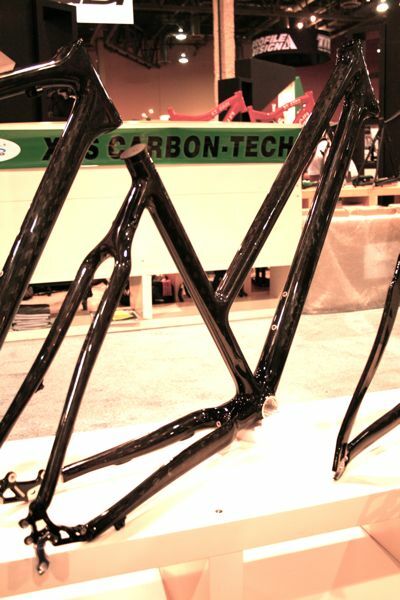 About the weirdest thing I saw at Interbike was this full carbon step-thru frame…with the fender, rack, and disc brake mounts. Of course, it was at one of those dozen or more booths occupied by generically-named Asian factories. Coming to an eBay near you soon! 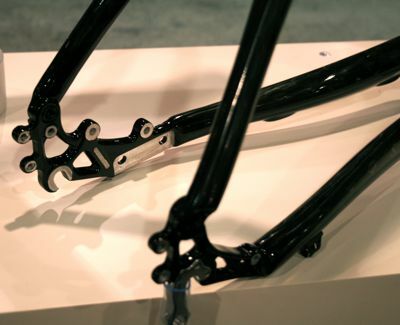 Taiwan and China are the sources for most carbon fiber frames and components. Sometimes a European or American company owns a factory there, sometimes they have an exclusive deal with the factory, and sometimes they just slap their logo on a part that the factory was shopping out to anyone with money. Is this good or bad? For most companies, it’s just the way it’s done if you want to sell carbon fibre. The consumer market has spoken, and they want affordable carbon. For all the interest in steel, people buy carbon more than ever and don’t seem to care that much where it was made. Oh, but not you though, huh? You only buy American? Well, I suppose your bike’s shifters are American-made, right? How about your computer monitor? You gotta love the details on this frame, such as the rear brake cable routing. Notice the guides on the left seat stay. Consider that brake cable routing would have to run down the top tube to the seat tube, then up along the seat tube before turning down and aft to follow the seat stay. Now consider that the disc caliper mount would be in the chain stay. Not a great design. Next Next post: The Best Bike Catalog. Ever.